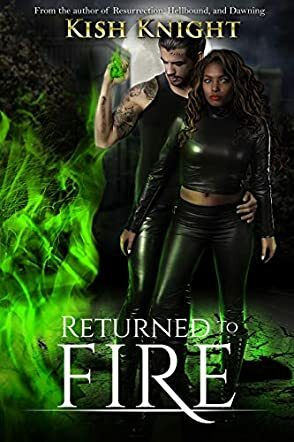 Returned to Fire: The Expanded Novel is a dark urban fantasy for new adults written by Kish Knight. Sionne had counted on at least several decades of “eternal beauty” when she sold her soul to the devil, and she was furious to find herself dead and burning in hell after only two years of the agreement. She had been only sixteen years old when she made the bargain, and she had done so in a desperate attempt to gain Aaron Aikens’ attention. That at least had been a success, but two years? It just didn’t seem fair, especially considering that Aikens had actually cheated on her. Sionne watched as her family and friends mourned at her graveside. She and her demon husband, Katse, were in the demon realm and could see what was going on in the real world while not being seen themselves. Katse was drop-dead gorgeous, but also a cheater. He was one of two demonic guardians who would be overseeing her one chance at finding out the identity of the person who killed her. Sionne had two objectives, however, as she had been told that finding one person who loved her would give her a second chance at life. But her time was short, and hell was waiting. As I began reading Kish Knight’s dark urban fantasy for new adults, Returned to Fire: The Expanded Novel, I couldn’t help but chuckle at yet another Faustian bargain gone terribly awry. No one ever seems to get the better of the devil when it comes to making the life-altering deal worth selling one’s soul for. Sionne’s reckoning comes with such swift and final quickness that you can’t help but feel sorry for her and hope that somehow she will find both her killer and the love she needs to stay on the earthly plane. Knight’s story is compelling and original, and it quickly had me involved in Sionne’s quest. I loved watching as she interacts with Katse, her demon husband, as well as with those earthbound people who see her as someone entirely different. Knight’s characters work quite well, and they make this dark tale work so very well. Returned to Fire: The Expanded Novel is most highly recommended.